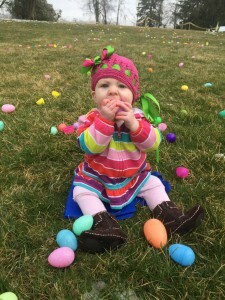 Adelaide Harris tests out her brand new tooth while on the egg hunt during Easter at Addie’s. Thanks to my daughter, it looks like we may have a new family Easter tradition! Imagine a green rolling field bordered at each end by trees, filled with plastic eggs of all colours and sizes. Children lined up in anticipation, eyes gleaming as they set out to gather as many eggs as humanly possible. Parents laughing at their children’s excitement. This is an egg hunt to be remembered. This is Easter at Addie’s. The Adelaide Hunter Hoodless homestead outside St. George, Ontario. 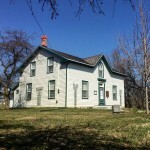 Travelling between Cambridge and Brantford, Ontario is the Adelaide Hunter Hoodless Homestead. The two story farmhouse and surrounding property becomes home to a charming Easter celebration every year. With a local fire truck on hand, face painting and a clown making balloon animals it already has the makings of a fun adventure. When you add in a petting zoo and cookie decorating, it’s hard not to want to join in the fun. Adelaide Hunter Hoodless was born in 1857 on the farm in what was then known as Canada West. The youngest of 12 children, she went through incredible personal tragedy before becoming an advocate for women’s rights and education, helping found the Women’s Institute and the YWCA. She passed away in 1910 but her legacy still lives on. As we named our daughter after Adelaide Hunter Hoodless, we only felt it fitting to join in the celebration this year for Easter at Addie’s. As it was our first visit to the homestead we enjoyed walking the grounds and checking out all the games and activities as part of the celebration. 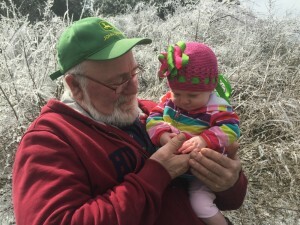 Trees glistening with ice form a backdrop as Howard Hill and his granddaughter Adelaide Harris examine an egg found during Easter at Addie’s. We didn’t let the ice storm this week hamper our spirits even though some of the activities needed to be cancelled – some food vendors, a carousel, and a donkey and baby chicks in the petting zoo. We let our nearly 8 month old daughter sit in the middle of the eggs and hunt for whichever one caught her eye, which for this teething babe was a wonderful thing. She looked very confused by the skittish lamb in the petting zoo but did reach out to not so gently pet the mother goat and would’ve loved to get into the cages with the rabbits had we not been holding her back. One of the best parts of the entire event were the volunteers. Everyone helping out had smiles on their faces and were more than willing to answer any questions and make sure the kids were having a great time. All in all, we were incredibly glad to have travelled down the highway to the Adelaide Hunter Hoodless Homestead for Easter at Addie’s. We are already looking forward to bringing Addie next year when she can run and join in all of the fun. 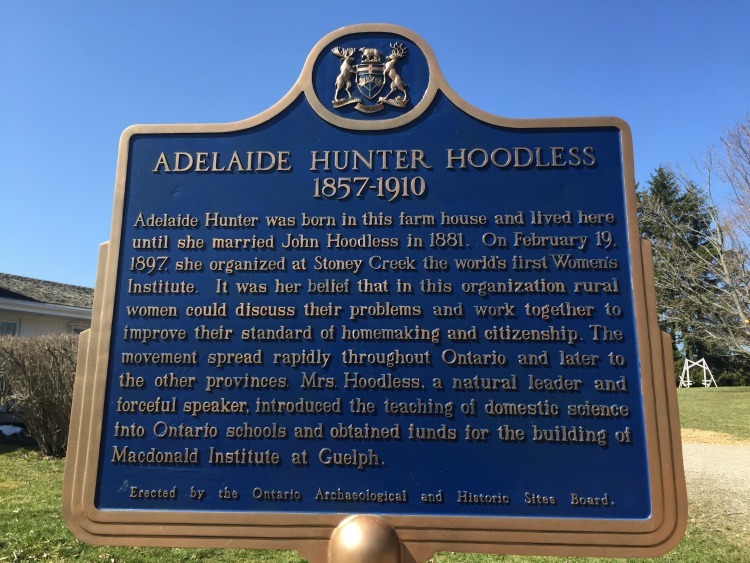 The plaque commemorating the life of Adelaide Hunter Hoodless stands outside her family homestead near St. George, Ontario. With gorgeous sun, warm spring temperatures, and a dog just begging to get out for a stroll, I found myself on what I feel is one of the prettiest streets in Cambridge, Ontario. Queenston Boulevard runs parallel to downtown Preston. Large trees, and even larger gorgeous homes. Walking from Dover Street to Church Street feels like you have been transported back in time. Houses there have all retained the charm of being built over 100 years ago, red and yellow brick, unique windows, porches, turrets and balconies. Every house is unique. The architecture is beautiful. 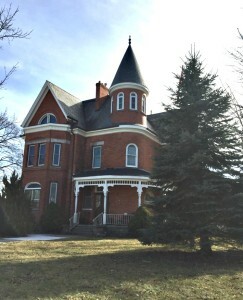 As of March 10, 2016, this 9 bedroom house on Queenston Boulevard is listed for sale on www.realtor.ca. This section of Queenston feels like old money, like every house has been handed down from generation to generation. Every occupant being doctors, lawyers or business executives. The houses are all in great repair. The yards are landscaped. It’s quiet. Peaceful. We walked along the street listening to birds chirping, and faraway dogs barking. People smiled as they passed. All was calm and serene. I couldn’t imagine ever living there, but I could imagine how creative I could be if I did. The dog, daughter and I turned down Church Street and again I marvelled at the houses. Smaller than on Queenston, and much closer together the further we headed away from downtown, but still lovely and well cared for. A right turn at Moore Street and I felt much more at home. I could live on Moore street. Houses still had charm and history, they were closer to the road, but with big back yards. This was a working class street. A street where people worked hard to buy their houses and kept them looking good because they know how important their homes to them. Some houses still had porches, some with second story balconies, a few even had bay windows. Gone were the turrets and third floors of Queenston. Here were two story lovely homes that lived and breathed. It was a quiet day but I could see this is a great place to raise a child. I imagined them laughing as they ran down the narrow sidewalk, drawing with chalk and jumping rope. I could see my own daughter there, learning to ride her bike, making friends, laughing and growing tall. Queenston is beautiful, a showpiece to our town. Moore Street is a place to live. A final turn down Dover Street and again, I admired the houses and architecture. Houses and yards get bigger heading back towards Queenston and the downtown core. Each one appeared well loved and cared for by their owners. Making it back to my car, I took a deep breath and soaked in the spring sunshine. One last look around and I drove away, back home to my townhouse in the suburbs with a tiny tree out front and a postage stamp back yard.